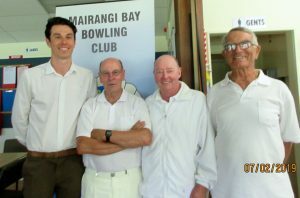 The winners with 3 and a half wins and 24 ends, was the team of Murray Radojkovich, Kevin Torrey and Gordon Ross and are pictured with Nicholas, the Customer Service Manager for Service King. Also with 3 and a half were Neil Buckner, David Payne and Wayne Glogoski with 21 ends. Third with 3 wins were Ian Hardy, Stuart Jamieson and Mike Wilkinson. The sponsor, Service King, who cleans the clubrooms, has been doing the job for 14 years, has our special thanks and are happy to provide a quote for any cleaning projects that you are aware of. Their services are listed on their website and include both commercial and residential services.